I was in Bethlehem in 2006. The difference between Israel and Palestine was amazing. At Nativity Square there were children selling candy to try and make a little money with the backdrop of the site of one of the most familiar passages in the Bible. But unfortunately, there is little peace in the Palestinian Territory. I had to remind myself that the angels in Luke 2 told the shepherds "Fear not". There is fear. I admit I breathed a sigh of relief when our taxi dropped us off in downtown Jerusalem after having been in Bethlehem. Because of that fear, tourism is down. I'm feel certain even more so now than when I visited in 2006. I bought most of my souvenirs in Bethlehem. I loved all the different items that were being sold made from Olive wood. To me Olive Wood seems so beautiful, and almost peaceful. It reminds me of Israel, and not the Israel I saw with soldiers but a more peaceful place. So when My Comfort Cross contacted me and said they would like me to do a review, I was excited to do so! 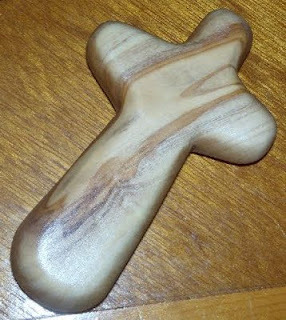 I received a "Comfort Cross" which is about four inches high and about 2 1/4 inches across. It was in a velveteen bag with a Scripture card. At first I thought it looked a little strange because I am accustomed to seeing crosses with sharp edges. However, this is made with actually USING it in mind. Some people might want to hold it while praying. The cross fits perfectly in the palm of my hand. When I was younger, I used to sometimes have nightmares. This would have been great for me to keep on a bedside table and hold when I woke from one of those. Depending on your Bible cover, you may be able to tuck it in there if you would like it with you when you are doing Bible study. I can imagine this being used with a child. Not only for teaching about Jesus and the cross, but also showing what olive wood looks like, and helping calm a child's fear. Think of when a child is afraid, placing this cross in her hands and relaying the story that it was made in Bethlehem and recalling the angels' words of "Fear not". These would make a nice gift. Something given at Christmas, to someone who is ill, the elderly, lonely, or a "thinking of you" gift. Comfort Crosses are also affordable. As a special to readers of my blog, you can CLICK HERE to order two crosses for $10. This also includes shipping within the USA. This is a $2 discount from the usual price. If you are interested in ordering in quantity either for fundraising or to give multiples of these, you can order eight of these for $40 or fifty crosses for $165 (that includes shipping). The crosses are made by Christian craftsmen in Bethlehem. When you make a purchase, this helps a Christian make a living in a place where I saw children selling candy to make a little extra money. My Comfort Cross has been generous enough to give TWO of my readers a Comfort Cross of their very own. Giveaway ends August 23th at 11:59 pm. Tell me either why you would like this or who you would like to give this to. FTC disclaimer: I received a MyComfortCross of my own to use and review. The opinions are my own. I have one of these on a keychain that I sometimes rub while I drive. I would love to give one of these to my mom. I would love to give this to a friend of mine. He would really appreciate it. I would love to give it to my daughter. She loves all the crosses that she has and this would be great to add to her collection. I would love to give this to my Pastor... It looks so smooth and beautiful. I would either keep this to remind myself of God's neverending grace and forgiveness or share with my sister who recently miscarried. LOVE these! I would keep it, I'm having some personal defficulties right now & could use it!!! 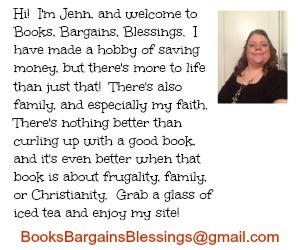 ((1955nursehjc4me(at)myway(dot)com)) TY! I like to give to my mom. I would love to win this for times those rough times. I currently have 2 nieces and a nephew. In 2003 I went on my very first missions trip with my church to Brazil. While there I bought a hand crafted and painted cross for my sisters first child, who she was pregnant with at the time. My second missions trip was to Peru and while there I has the opportunity to but another handmade cross, this time for my second niece. Since the birth of my nephew I have not been on any missions trips, but the thought of keeping the tradition of buying them their own special crosses has been in the back of my mind. If I were to win this I would gift it to my nephew in order to keep the tradition going. Each one of their crosses would have their own special story. Thanks for reading this, God bless. I followed via Google Friend Connect! I think my dad would really love to hang this up in his office. 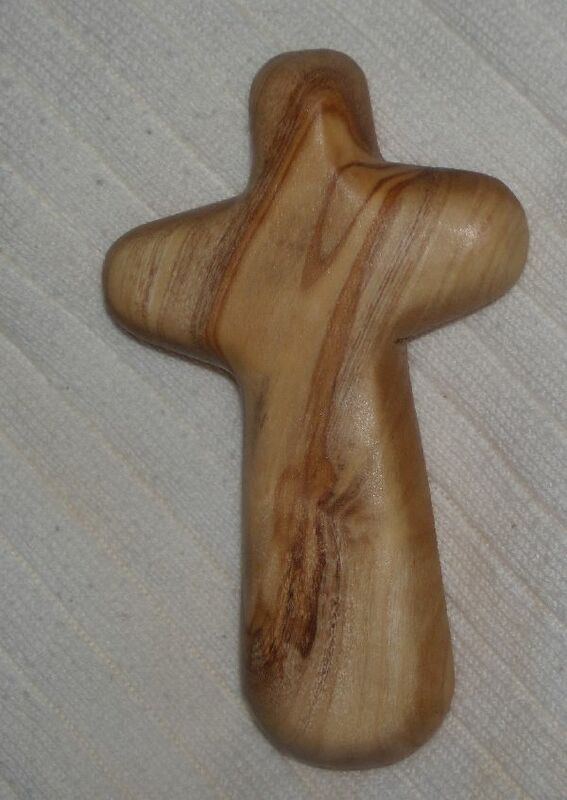 I learned that the Comfort Cross is made from genuine olive wood in Bethlehem, the Holy Land. Would give to my sister for your new baby's nursury! Learned it is made from renewable resources! That's a plus! I'm giving birth to my first this November and would love something like this to keep in my hands as I go about it! I would give it to my teen daughter for comfort through out the school year. I would give this to my mom. I know she'd cherish it. Thanks! I learned that Christian craftsmen have been carving the branches thinned from the olive trees since the fourth century. So cool! I would love to give this to my mother or my grandmother. I think they would both like it, so in the end it would be hard for me to pick between them. I really like the way this cross looks. I learned that Each craftsman receives a fair price to support their family and Christian community. These are beautiful! My mother-in-law has been ill for some time and has recently taken a turn for the worse - I would love to give one to her. Visited the website and learned about how long olive trees live (I had no idea!) And I LOVE that the trees aren't cut down to harvest the wood for these crosses. With my husband recently having a heart attack and our many other troubles this would be comforting to have. I think this would be really comforting. My 12 yr. old just asked to be baptized. I think I would like to give this to him on theat day. I learned that in recent years, the decrease in tourism and reduction in suitable olive wood has caused many Christian craftsmen to emigrate from the area where these are created. It would be sad to see this craft lost. I would like to give this to my mom. She's wanted to visit Bethlehem for several years now and has never been able to financially. A cross from the religious land would make her so happy. Thank you. I would love to give one of these to me niece. This would make a wonderful gift for a friend of mine. Her husband was in an accident and will be in the hospital for a long time. I can see it bringing her comfort as she sits by his bedside. I would love to give this to my Father. I learned your church can sell them for a fundraiser. I would like this for my MIL who has taught me a lot about the love of God. The olive tree is an evergreen which can grow for thousands of years. The tree admired by Hosea whose leaves have been a sign of abundance; glory and peace are still used to crown victors in the Olympic Games. The oil from the fruit used to anoint the sick.